Propaganda used by the United States and its partners amid its destructive campaign of regime change aimed at the Syrian government has collapsed. Western media platforms find themselves relying on increasingly absurd narratives told to an increasingly smaller audience. They also find themselves the targets of growing criticism from around the world. The US and its allies are currently reporting “violations” of the UN resolution regarding a ceasefire in Ghouta despite the text of the resolution itself authorizing continued military operations against Al Qaeda and its affiliates both in Ghouta and across the rest of Syria. Putin-Assad seem to be using the presence of an al-Qaeda linked group (Ahrar al-Sham) in one tiny corner of Eastern Ghouta as an excuse to attack civilians throughout the besieged enclave despite UN Security Council ceasefire. Roth never explains why Syria or Russia would use their limited military resources to “attack civilians” instead of the armed terrorists Roth himself admits are present in Ghouta attempting to overthrow the Syrian government and kill both Syria and Russian personnel in Syria – and this among other unraveling narratives is why the West’s propaganda war has lost tremendous ground. However, despite this important step forward, exposing and derailing the propaganda component of the West’s war on Syria alone is not enough to stop Western military aggression – both direct and by proxy – or to eliminate the threat Syria and its allies – as well as the entire region – still face. The United States’ ability to wage war on nations like Iraq, Libya, Yemen, and Syria is not owed to its ability to tell convincing lies. Instead, it is rooted first and foremost in its immense economic and military power which in turn affords it equally immense and unwarranted influence and political power. This is reflected in the corporate-financier sponsorship of US policy think tanks – institutions of unelected policymakers who in fact devise long-term US foreign policy and merely have politicians rubber stamp it legislatively, while media organizations promote it publicly. The ability of the US to intervene in, invade, and occupy nations around the globe is dependent on its massive resources, including a network of military bases and logistical hubs, fleets of ships used to move weapons and equipment into theaters of military operations and to continue resupplying forces for years at a time. This is a network that rising nations even as big as China will takes years to develop, if they ever develop them to the extent the US has. Nations and blocs attempting to confront and balance global power against Western hegemony understand this fully. The rising economies of nations like China, regions like Southeast Asia, the BRICS association, a reemerging Russia, and other developing nations around the globe are accompanied by attempts to create an entirely alternative global order based on multipolar geopolitics. This includes the creation of alternatives to the US dollar in global trade, alternatives to US and European dominated industries and markets, and the creation and proliferation of defensive military technology negating America’s long-standing military superiority. These efforts are extensive. ongoing, and long-term. It will take years still to rein in US aggression and the military and economic primacy that underpins it. Until a global balance of power can be struck, the maxim of “might makes right” will continue to prevail and define the global geopolitics of the US and its allies. For nation states across the globe, the process of creating alternatives to compete with and eventually displace US and Western hegemony is already ongoing. Unfortunately, for most individuals around the globe, both the genuine root of the problem and the solution is still poorly understood. For the many people invested in resisting Western propaganda, many still find themselves on a daily basis paying into the very corporations and financial institutions underwriting that very propaganda and driving the agendas that propaganda serves. Very few – even when aware of this – have the desire to commit themselves to a full spectrum boycott of the Western corporations driving Western military aggression globally. Fewer still have the desire or ability to contribute to alternatives to the West’s long-standing monopolies. However, there is hope. The alternative media itself is an example of many ordinary people around the globe with differing political and ideological backgrounds creating alternatives to established Western media monopolies. They have forced Western media monopolies to react and adapt to the growing competition and in many ways it has been this growing competition that has compromised the many ongoing narratives the West had once been able to perpetuate with impunity. This includes the narratives the US has used versus Syria. The main driving factor behind the alternative media has been technology. It once took large amounts of capital – both financial and human – to run a news room in order to reach thousands or millions of readers. Today, tools for publishing written, audio, and video content are free or cheap enough for virtually anyone to afford. A single person can access thousands, even millions of viewers. The smaller budgets available to developing nations are more than enough to compete with established Western propaganda, provided their content is of more substance than the West’s. While Western monopolies have struck back with a series of technological solutions including algorithms designed to favor corporate media, these solutions will only provide a temporary reprieve. Technological progress in other industries ranging from energy to manufacturing are helping decentralize the many economic and military fields the West has long dominated. Even within the West itself, technology is enabling emerging entrepreneurs who do not share Wall Street and Washington’s principles or lack thereof and seek a different and more constructive direction for the West. It is important to understand the Syrian conflict in the much larger global paradigm it fits into. By understanding this, we can collectively expose and undermine the special interests fueling the conflict. Currently, the US and its allies have exhausted their proxies and find themselves more directly engaged in military intervention in Syria. Defeating this conspiracy against both the Syrian people and the peace and stability of the Middle Eastern region can no longer be done by simply exposing and eliminating the West’s proxies. It must also include a strategy of exposing and eliminating the very source of power driving the West’s agenda in the first place, well beyond Syria’s borders – on Wall Street, in London, and Brussels. It must be done by identifying and displacing the unwarranted power and influence of Western corporate-financier monopolies. The emerging victory over Western propaganda is only a start. But it is a start that can be built upon and expanded to include a continued campaign of raising awareness and pressure regarding Western aggression against Syria itself, as well as a campaign aimed at placing pressure on and even displacing the special interests responsible for this aggression. Tony Cartalucci is a Bangkok-based geopolitical researcher and writer, especially for the online magazine “New Eastern Outlook” where this article was originally published. 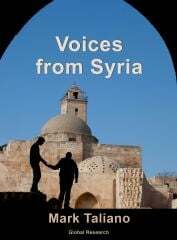 Order Mark Taliano’s Book “Voices from Syria” directly from Global Research. Taliano talks and listens to the people of Syria. He reveals the courage and resilience of a Nation and its people in their day to day lives, after more than six years of US-NATO sponsored terrorism and three years of US “peacemaking” airstrikes. 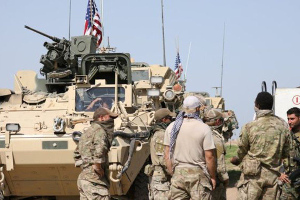 Mark Taliano combines years of research with on-the-ground observations to present an informed and well-documented analysis that refutes the mainstream media narratives on Syria.